Well, on Sunday evening I finally bit the bullet and retired my Authonomy account, shedding a silent tear in the process. Henceforth, no more ‘blueheart’, my screen name for the past two years. (Thank goodness, I am a relative ‘newbie’ to this writing community without the crusty familiarity of those old-timers with 5 or 6 years under their belts – my constitution probably wouldn’t stand it.) I thought it better to quit gracefully before The End rather than wait for the big switch to be pressed. At the appointed hour on 30th September 2015 – less than a day now – Authonomy will be history. Barring an Act of HC, Harper Collins will pull the plug on its digital plaything/electronic slushpile/innovative publishing venture, whatever it actually was (to its creator, that is). To writers like me, who used it day after day, it was an invaluable resource in all sorts of ways – for honing one’s writing skills (e.g. the terror-inducing say-it-as-it-is Faux Agents thread), road-testing one’s stories (I got an incredible amount of help from the Women’s Fiction Critique Group), exchanging views, information and gossip on everything from publishing to politics, or just passing the time over virtual coffee and doughnuts (Authonomites are – were? – a pretty weird highly imaginative bunch). Most of all, it was a place to connect with other writers. The Editor’s Desk chart was the main draw for many newcomers, me included. In my time, that was arguably the cause of the most bickering (the revamped site’s much-maligned algorithm for determing a book’s chart position being a case in point). But it wasn’t the most important thing about Authonomy. That was, to my mind, the community. It was about belonging to a group of people with enough in common (writing, of course, but also moaning about HC’s oversights re the new site) and enough differences to keep the place lively (yes, a slight understatement – unfortunately along with the good stuff there were some nasty disputes and disruptive people). We were Authonomites, first and last… OK, somewhere high on a list of important things. A little on my own experience. I started logging on regularly after uploading, with great trepidation, ten chapters of GoC in February 2014. In time I went from being a forum-illiterate shrinking violet to… well, not exactly the life and soul of the virtual party, but definitely an active member of the site. And I got attached to the place. It became a virtual home-from-home, a place to escape to late at night when there was nothing on the telly, or (rarely, of course) post-domestic disharmony… At one time, ironically, I even worried that I was spending far too much time there and would need a lengthy absence to detox. Apart from the serious business of reading and commenting on books, there was sharing in the ups and downs of the people I’d come to know, along with occasional idle goss about who had the biggest hair, or whatever. A few days ago, in the spirit of Authonomy’s goodbye bash, I even voted for the Sexiest Male on Authonomy and contributed some virtual hash brownies. Of course, the real people behind their eyecatching screen names and avi’s will still be out there, somewhere. There are other online writerly places. The WFCG is reincarnating itself, as I believe are some other editing/critique groups. But it won’t be the same. I had a silent titter whenever I saw Groaner’s pink pig or Colin’s fluffy squirrel and many other wacky names (John’s Left Sock was my favourite) that people used to identify themselves. And now? There’s a deleted bookmark set to Authonomy, a few screenshots and some stray bits I salvaged from the wreck. Cindra and Kali made ‘the desk’ in the past few months. Kali has had great news recently, chosen for Hachette Australia’s writer development program – with Hachette getting first publishing bite at her novel. I imagine the wonderfully immersive, richly evocative writing in The Songs of All Poets will delight them as much many of those who read it on Authonomy. Cindra’s novel The Ensanguined Flowers earned a glowing review from HC – she deserves to find an agent and publisher soon, is all I can say. Her novel is full of drama and comic overtones, bleak to black at times – and the most horrendous scene involving a vegetable peeler I trust I shall ever read. As to the witty, enigmatic Mr Holland, book reviewer par excellence (the 3 categories he won in the Authonomy Closing awards)… what can I say? Letters is the most original, funny, smile- and tear-inducing novel I’ve read in a long, long time. One day, and I hope that day is soon, a publisher worth its salt will snap it up. In the meantime I’m savouring my Kindle download of it. Strangely enough, after months of being ignored by The Algorithm despite getting rated perfect 6s, Raymond’s LFASIASOSAM (hope that’s right!) 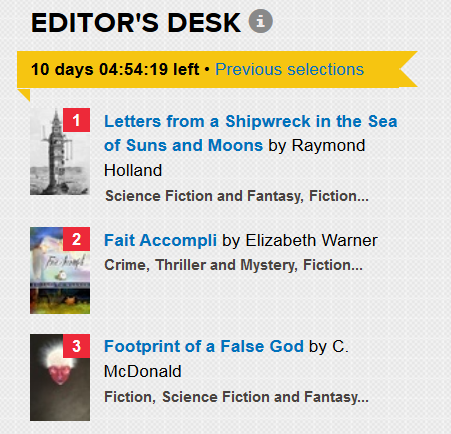 shot to the number 1 slot in the last week of Authonomy’s existence. Too late for an Editor’s review but perfect timing for Mr Holland and his watery masterpiece to be emblazoned on the collective consciousness that is – was – Authonomy. More importantly, it allowed ample use of dubious shipwreck metaphor humour in some of the final forum posts. Now, who said that the Algorithm wasn’t smart? I think it’s got a bloody good SOH. Enough of this. Time to move on. No more reminiscing about silly messages and irreverant posts. It’s all over, folks. But it was fun while it lasted. Nice post. I will miss Autho but after six years of crusty familiarity (thank you for that) I’m also looking forward to new pastures. Lots of familiar faces on Scribblers. Oh my. . .to even appear in the same sentence as Songs of All Poets (Kali Napier) and Letters from a Shipwreck in the Sea of Suns and Moons (Raymond Holland) is a compliment so big I’m still digesting it. I don’t know exactly how I bumbled into surrounding myself with the greatest writing talent around the globe. I’m sincerely flattered; thank you Ms. Ensor. You, and your books, are an inspiration. Oh my. . . Incredibly honored to be mentioned here. To even appear in the same sentence as Songs of All Poets (Kali Napier) and Letters from a Shipwreck in the Sea of Suns and Moons (Raymond Holland) is a compliment so big I’m still digesting it. I don’t know exactly how I bumbled into surrounding myself with the greatest writing talent around the globe. I’m sincerely flattered; thank you Ms. Ensor. You, and your books, are an inspiration. Thanks Cindra – I’m only too glad to spread the word about The Ensan Enssang…?? I mean those Bloody Stained Flowers! Jennie, you are one of the best writers I encountered on Autho. I’ll never forget how gripped I was by Everyday Deceptions. It’s not often that I forgo tea breaks to keep reading. Definitely agree – Shipwreck and The Ensanguined Flowers are both wonderful books. p.s. You are also a lovely person and supportive writer friend.